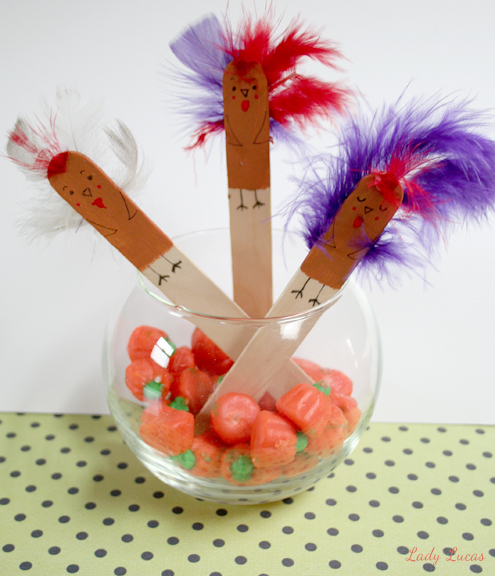 Create kids’ Thanksgiving crafts to decorate your home! 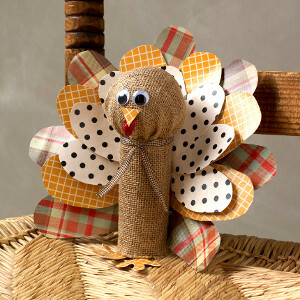 These super cute decorations are the perfect touch for your Thanksgiving table spread, and kids will love making them! 1. 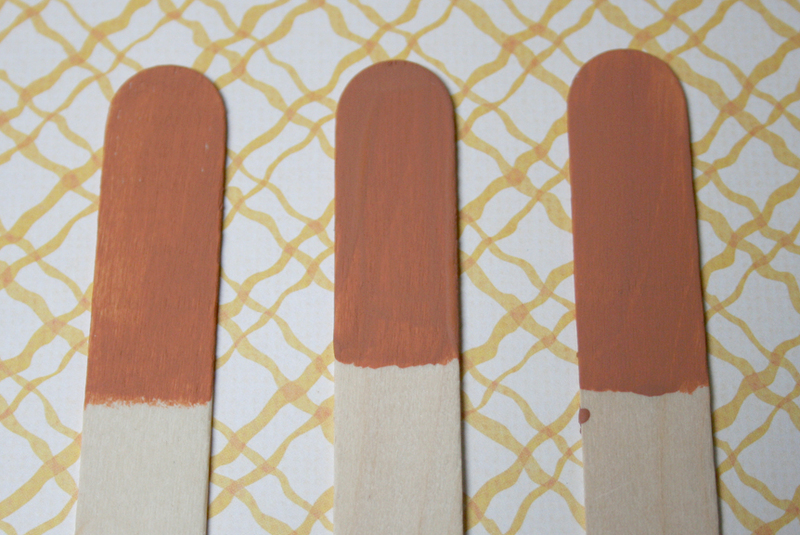 Paint the top of your Popsicle sticks with brown acrylic paint. About ⅓ of the entire Popsicle surface is the perfect amount. Let dry completely. 2. Add faces to your turkeys using a fine tipped black sharpie marker. Experiment with all different expressions! Add wings, legs and feet as well. 3. 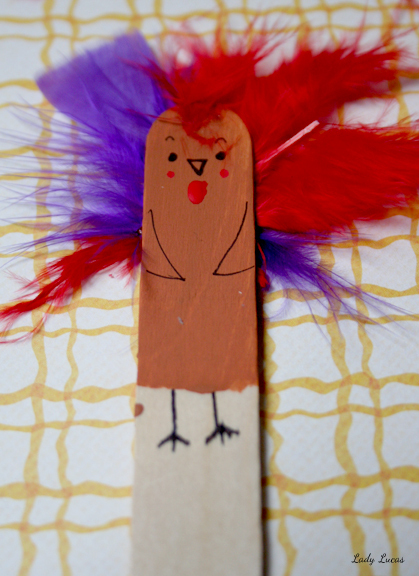 Use craft glue to apply feathers to the back of the turkeys and add a little red feather to the heads of each bird. 4. Add a little red paint under each turkey beak and some cheeks with a pink Sharpie marker. A little dot of red paint for the cheeks if you don’t happen to have colored Sharpies. 5. Decorate the home with your turkey friends by placing them in vases around the house, in flower bouquets on your dining table, or by sticking a few in your holiday centerpiece. Happy Thanksgiving! Check out Lady Lucas’ Etsy shop here! What’s your go-to Thanksgiving decoration? When I was a kid, I spent most of Thanksgiving trying to get into the kitchen. My mom might tell you I was trying to get some pre-dinner snacks, but the truth is I ran out of things to do and wanted to get in on the cooking fun. 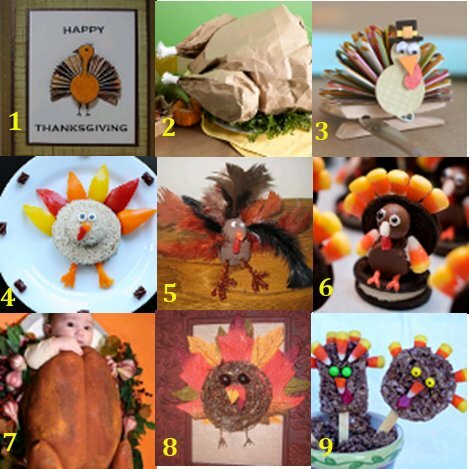 Looking back, I definitely wish I had access to some awesome Thanksgiving craft ideas like these to keep me busy. AllFreeKidsCrafts has compiled the best Thanksgiving activities for kids that will entertain any number of your young relatives, whether you have a full house or only a handful of kids running around. Your family will love these Thanksgiving crafts for kids, and they’ll be thankful for your crafty ingenuity! From brain games to boat races, these Thanksgiving activities for kids have a game for family members of all ages. These Thanksgiving games for kids are a great way to keep your little ones entertained or to get them up and moving after a delicious dinner. No matter what you play, these fun Thanksgiving activities for kids are definitely worthy of becoming a new holiday tradition for your family. Keeping your kids busy with you in the kitchen can be fun! While you might not be able to get kids excited about vegetables, these edible Thanksgiving crafts will show them how much fun Thanksgiving food can be. Even if you already have a traditional pumpkin pie ready to go, you won’t be able to resist these Thanksgiving crafts for kids. Make these sweet Thanksgiving food crafts, and you’ll be on your way to a perfect Thanksgiving feast in no time. Whether you’re looking for turkey crafts for kids or decorative Thanksgiving craft ideas, these projects are ones your kids will love to make. You could even give a short lesson on the history of Thanksgiving while you make these thanksgiving crafts for kids with your family. Even the youngest relatives can join the crafting fun with these Thanksgiving activities for kids. When you were a kid, what was your favorite part of Thanksgiving? Are you having Thanksgiving dinner this year? Plan the perfect holiday party this November with our latest free eBook! When you grab your free copy of our latest holiday eBook, 8 Thanksgiving Crafts for the Home you’ll find a collection of kids’ crafts, decorating ideas, and turkey crafts perfect for the holiday. From Thanksgiving party décor to fun and easy crafts for kids, this go-to holiday guide will show you how to plan the perfect bash without breaking your budget! 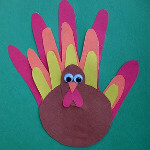 Learn how to make turkey crafts that are so simple and fun, the kids will be sure to love them. No matter what type of activity you’re sharing with your family, these fun Thanksgiving crafts will be an instant hit. You can add a rustic feel to your party with the nature-inspired decorating ideas included in 8 Thanksgiving Crafts for the Home. No matter what you need for your Thanksgiving party, this eBook will have you covered! From table decorations to turkeys, these handmade Thanksgiving crafts will have your house looking seriously spectacular. With the help of our free, printable Halloween eBook, you’ll be able to start on your Thanksgiving home décor without the stress of searching for ideas. Free up some of your spare time to start making Thanksgiving décor, it’s a sure fire way to make your house the warmest one on the block. 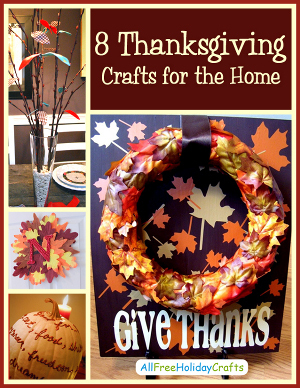 Ensure that your family feels warm and cozy this year and download your copy of 8 Thanksgiving Crafts for the Home. 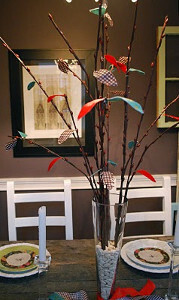 Decorate your table, door, and entertain the kids with one handy craft guide for the holiday! Grab your favorite ideas out of our free eBook, 8 Thanksgiving Crafts for the Home and get started on some of these holiday treats. 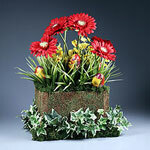 These delightful and decorative ideas will set the mood of your holiday home. Whether you are searching for fun activities and crafts for the kids, handmade table decorations, or turkey crafts, the cute selection of Thanksgiving crafts included in this eBook will have something to complete your holiday. Plan the perfect Thanksgiving dinner yet with some of the cutest, and most clever, Thanksgiving crafts ideas that you can find. We’re sure you won’t regret making any one of these fun tutorials. How do you plan to decorate for Thanksgiving this year? BONUS: Fa La La La Felt giveaway! 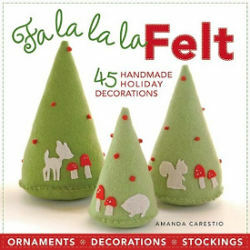 Win a copy of Fa La La La Felt: 45 Handmade Holiday Decorations! The deadline to enter is November 19, 2013 at 11:59:59 p.m. Eastern Time. With your own copy of Fa La La La Felt: 45 Handmade Holiday Decorations, you’ll be able to make all the handmade ornaments, stockings, and Christmas decor that your heart desires. You can enter once daily, so return often to improve your chances! Looking for a unique way to celebrate Thanksgiving that doesn’t involve basting the turkey or prepping the cranberry sauce? AllFreeSewing pulled some of our famous kid-friendly projects and paired them with edible counterparts to deliver an awesome side dish to the big meal. Perfect for a November birthday, fall festivity, or as an activity for the children while the adults are preparing the meal, these projects will surely inspire imaginations everywhere come November 28th. What better way to celebrate the harvest season than by incorporating one of its icons into your kids’ festivities? After Halloween, you’re probably not ready to carve yet another squash. 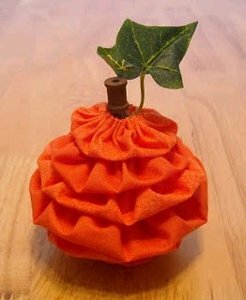 Skip the hassle and keep your room clean by creating an easy Yo Yo Pumpkin with your little ones. A simple sewing project, this craft teaches you how to make a sewing notion and delivers a finished product children will be proud to show off. Best of all, these Thanksgiving goodies can double as table decorations for both the kid and adults’ tables during the big meal. 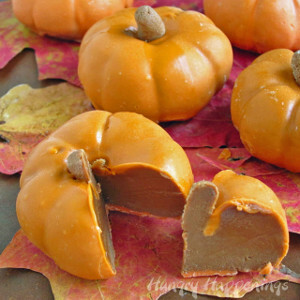 Once the kids are done sewing their yo yos, reward them with these Chocolate Caramel Pumpkins. The shape alone of these adorable mini squashes is the perfect complement to their fabric equivalent. Although the real turkey is the main attraction during thanksgiving, let the kids feel like they, too, prepared the big bird. We’re wild about the Handprint Turkey Softie that any supervised child can complete. Use fabrics that coincide with your table decor and sneak these plushies along your buffet for added, extra elegance. 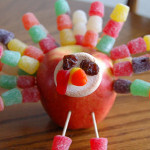 Once your group of rowdy pilgrims has finished their DIY turkeys, make some quick, stress-free treats as a sweet reward. 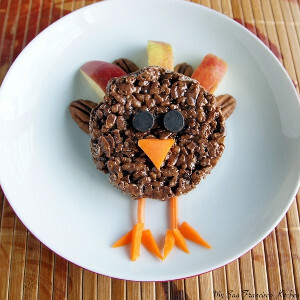 We’re loving these Cute Chocolate Rice Cereal Turkeys as a mid-afternoon snack! Take this opportunity to discuss the symbolism of the cornucopia with your kids. While it sounds like a large task at hand, it’s not difficult to mock up your own DIY horn of plenty. We are head over heels over this Thanksgiving Stuffing template from Spoonful. 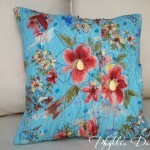 Get the templates here to create these fabric cornucopias. 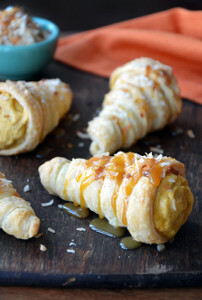 Afterwards make some magic in the kitchen with these Pumpkin Puff Pastry Cornucopias! 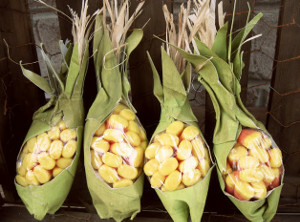 See if your kids will be able to tell the difference between these sewn corn husks and the edible ones. Thanksgiving Harvest Table Toppers are perfectly festive, as well as an easy project for your little ones to make. Afterwards create these A’maize’ing Candy Corn Favors for children to take home after the party. Looks like you’ll have everything on the menu, though a little less traditionally, with these Thanksgiving crafts. 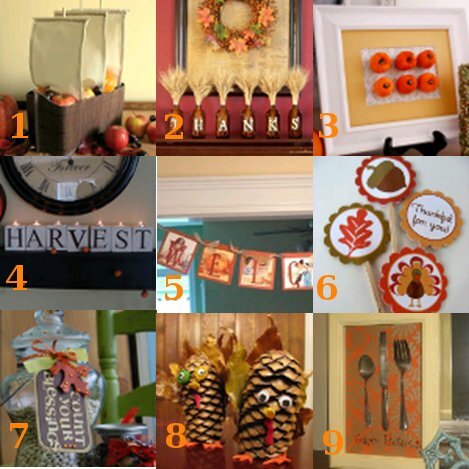 If you want more DIY decorations, be sure to check out the free eBook, Give Thanks: 10 Sewing Ideas for Thanksgiving! What’s the best job a kid can do to help prepare for the Thanksgiving meal? Thanksgiving may be my favorite American holiday. It’s got some tough competition with the heat of the 4th of July, the pride of Memorial Day, the love of Valentine’s Day, and the spook of Halloween, but there’s something about the family time associated with Turkey Day that brings it to the top. Between the football, food, and family, I’m a happy camper. Though there’s one thing missing from that list, though, that will bring your Thanksgiving from fabulous to one to remember forever. 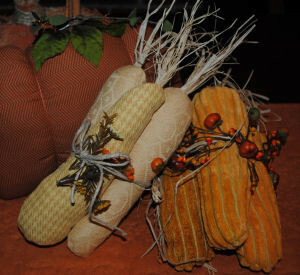 Weave Thanksgiving crafts for kids into your celebration, and the quality of your family time will increase tenfold. The inherent cooperation, creative charge, and excitement associated with crafting will bond the family like no other activity. 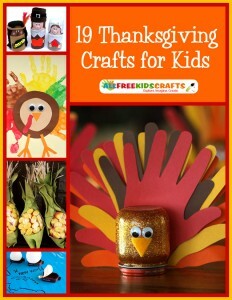 Keep the free eBook 19 Thanksgiving Crafts for Kids by your side this November for a festive, family-oriented, and FUN autumn season. 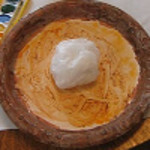 There are craft projects for all ages, which means that the entire family can participate in this road to thankfulness. That’s right; these projects aren’t only a blast, but they’re also the perfect vehicles for opening up a conversation about the history of the holiday and the importance of showing gratitude. As an added bonus, when you spend time crafting with the “fam,” you’re focused less on eating and more on bonding, leading to a holiday season sans the tight pants! There’s argument over whether there was actually a turkey at the first Thanksgiving, but despite its presence or lack thereof, the turkey has become the symbol of Thanksgiving. To open up discussion about the meal that started this all and to fill your home with festive fowls, craft some of the adorable turkey crafts found in this free eBook. Between handprint feathers, rustic versions, and environmentally-friendly birds, everyone will find his perfect project within these pages. 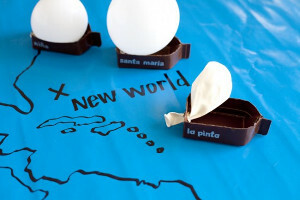 Nothing is better than a fun activity that kids don’t even realize is educational. While they’re creating, discussing, and playing with these 19 Thanksgiving Crafts for Kids, they’ll also be learning about history, hardships, and gratitude. Start with the boat races to learn about the Niña, the Pinta, and the Santa Maria, and then craft realistic corn to learn about what life was like in the 16th Century. 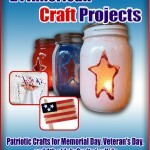 Learning is infused in each and every one of the crafts presented in this free eBook, so you can’t go wrong with whichever you choose. What is your favorite aspect of the Thanksgiving holiday? The leaves have fallen, and that turkey is calling! That’s right, Thanksgiving Day is coming, and as always, it’s approaching fast. Now this can only mean one thing for hostesses and crafters alike: it’s time for us to rally! Let’s be honest, it’s very easy to forget all those tiny details that go into hosting Thanksgiving, especially with Halloween and Christmas on your mind. Don’t get lost in the holiday shuffle! 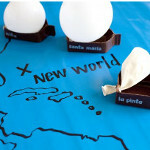 From table runners and centerpieces to kid’s crafting projects and activities, there is plenty to prepare for. But don’t worry, there’s no need to get anxious (yet) – AllFreeHolidayCrafts.com has your back! With a collection of Thanksgiving crafts to be grateful for, you’ll be sure to find some holiday crafting inspiration. Let’s be honest, preparation can tend to be pushed off until, let’s say, the weekend before? But this year, be in charge, be in tune and be one with your holiday crafting. When you’re on kitchen lockdown, making sure your children are occupied is at the top of your, “important things to remember during Thanksgiving” list. It’s hard enough preparing an entire turkey, stuffing, rolls, sweet potatoes, casseroles and all those amazing eats. Add ‘keeping two eyes on the kids’ to that list and you’ve got holiday hostess overload! 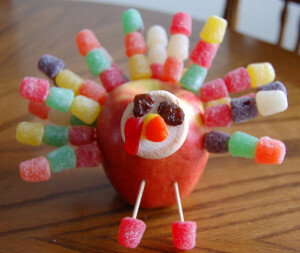 Give yourself one less responsibility by organizing some Thanksgiving craft ideas the little ones will love, in advance. Keep them busy in the playroom with a few festive activities while you’re busy in the kitchen. It’s your party, so why wouldn’t it be a stress-free Turkey Day? The crisp cool air and beautiful fall foliage is hard to ignore during those relaxing autumn months. Take advantage of the richest natural color palette of the year while you prepare your Thanksgiving home decor this November. Whip up an easy Thanksgiving centerpiece that will pick up on those rust oranges and deep burgundies that the trees blanket the ground in. Finish off your table with an autumn table runner by Angie Holden from The Country Chic Cottage, that will be sure to add a dollop of holiday spirit to your meal. Go all in with these gorgeous fall decor ideas which bring an extra serving of Thanksgiving thoughtfulness to your party. Plan ahead this year, and alleviate some of the stress that comes along with planning and making a perfect meal with these Thanksgiving crafts to be grateful for. This list of fun activities for kids and beautiful homemade Thanksgiving decorations will be sure to make your holiday dinner party one to remember! Have you started your preparations for Thanksgiving Day yet? Thanksgiving is all about celebrating everything we have, from the bounty of the harvest to the support and love of friends and family. Gather everyone you care about this year for a marvelous feast to commemorate this momentous occasion. But don’t stress—FaveCrafts and RecipeLion are here to help. With our latest FREE eBook, you can create the perfect autumnal atmosphere for your Thanksgiving celebration. 24 Thanksgiving Dinner Recipes and Fall Craft Projects will help you host a picture-perfect evening, complete with all of the recipes and decorations you’ll ever need. From home décor projects to kids’ crafts, this all-inclusive guide is the best tool for a flawless Thanksgiving feast. A list of traditional roast turkey recipes, stuffing recipes, side dishes and desserts precedes the ultimate guide for the holiday crafter. Gifts, centerpieces, wall decorations and more make this an irreplaceable tool for the thankful soul. Set the table with Colorful Fall Leaves Dinnerware and Pretty Pumpkin Napkin Rings before you complete it with recipes like Brined Wild Turkey and Apple Pie A La Zing. 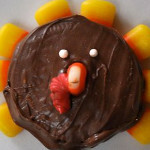 Plus, the kids will love making Candy and Cookie Turkeys and other edible crafts! But be careful; if you use this guide, everyone will beg you to host Thanksgiving every year! Click here to download 24 Thanksgiving Dinner Recipes and Fall Craft Projects eBook! Link Love: Get Ready for Thanksgiving! Before you have all of your guests over for Thanksgiving dinner, make sure to deck out your house in some homemade decorations! 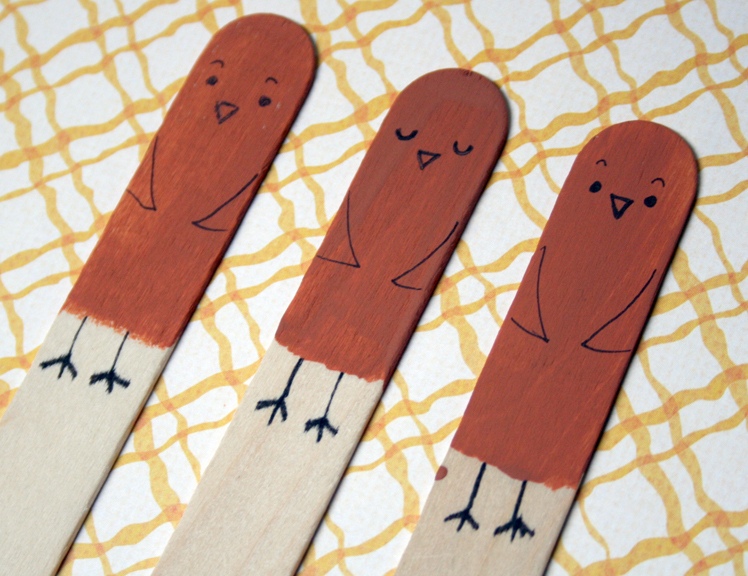 And if you have to choose between cleaning the house and making these adorable crafts from around the blogosphere, well, I think you know what the right decision is. If you love Pottery Barn copycat decor, check out The Pink Peony of Le Jardin and make this strikingly similar Mayflower centerpiece. Give thanks for food, family, and your die-cut machine with this mantel centerpiece from Thrive. Delia Creates made this 3D Pumpkin Art for Halloween, but it could work for Thanksgiving too! Warm up your home with candles in harvest blocks from Just Between Friends. Everyone loves a good party banner! 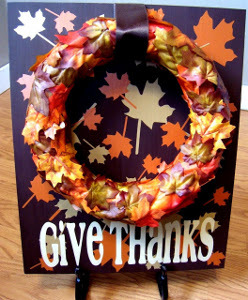 Head over to Little Birdie Secrets to see how to make a welcome banner for Thanksgiving. If you’re making cupcakes for Thanksgiving (and who isn’t?) use Skip to My Lou’s free printable download for cupcake toppers. Heartland Paper has a bunch of Thanksgiving ideas, including this sophisticated Count your Blessings jar. Pine cones are so versatile! 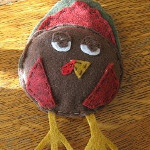 Make turkeys with the kids using this tutorial from Naturally Educational. Use old silverware to make a Thanksgiving shadow box decoration from Blue Cricket Design. You know what my favorite part of Thanksgiving is (besides the delicious mashed potatoes and food coma that is sure to ensue)? Turkey crafts! What’s cuter than a handprint turkey, or a turkey with googly eyes, or turkey feathers made from accordian folded paper, leaves, candy corn, and other genius ideas? 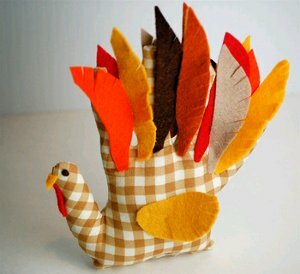 I love all of the turkey crafts below because they use such different materials to make the same delicious subject. 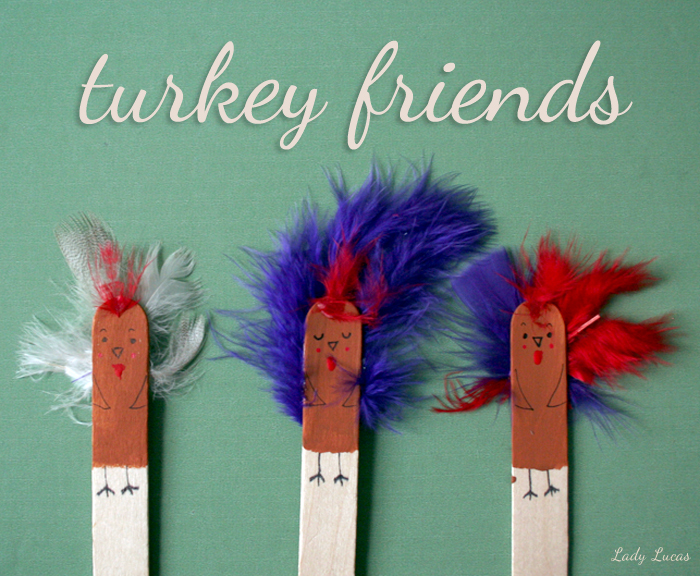 Read on to discover some crafty, clever turkey crafts to make for your home this Thanksgiving. Send an easy Thanksgiving Rosette Card from Patti Behan. This Paper Bag Turkey from One Charming Party sure is clever! 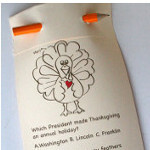 These Turkey Clips from Fiskars can be clipped just about anywhere to add a special detail to your table. This Turkey Sandwich from Meet the Dubiens may or may not contain actual turkey. 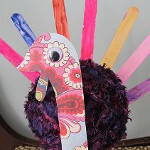 Make a Model Magic Turkey from 4 Crazy Kings, and don’t forget the feathers! 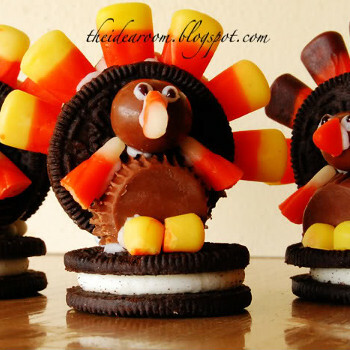 Combine your two favorite things–oreos and candy corn–to make these Oreo Turkey Cookies from Cut Out and Keep. Words cannot express my feelings about this Roast Turkey Costume from Martha Stewart. 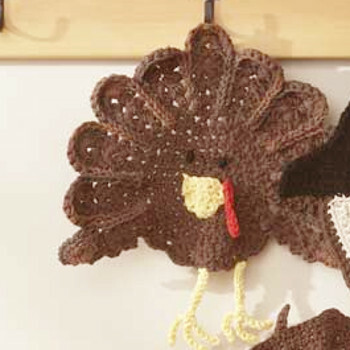 Add a little gobble gobble goodness to your walls this fall with this cute Turkey Wall Art from Therapeutic Crafting. Here’s another edible turkey with no meat in sight! 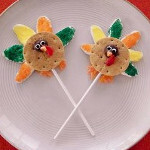 These Rice Crispy Turkeys from Family Corner also include candy corn–yum!